1. Choose Clothes With Vertical Lines – There is a golden rule for people who have a broader or wider bone structure – tone down the effect. You have to negate the horizontal by the vertical. You would notice that if you wear clothes with long vertical stripes, they create a sort of slimming illusion that balances your body shape beautifully. Hence, always choose clothes that further this illusion by choosing vertical stripes. 2. Don’t Wear Large And Baggy Clothes – This is the most common mistake committed by people who are plus sized. 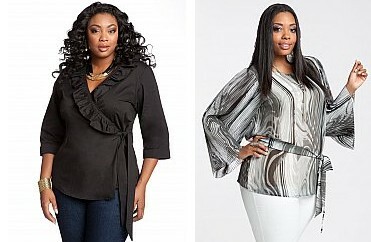 You don’t have to wear a tent for a top when there are beautiful and stylish plus size tops that you could don. This is, in fact, a fashion faux pas for plus size people and you must avoid it at all costs. The bigger sizes you wear, the more damage they do. Instead of making you appear slimmer, they create an effect of making you look heavy and bulky. Always remember that you have been given curves that most women would die for. So, try to accentuate these assets. Go for womanly fits that focus on the positives in your figure and take the attention away from the negatives. 3. Go For V Necks – The idea of a V neck is to create the effect of the wearer having a delicate and long neck. This illusion will, in turn, balance the top half of your body into something much more lean and elegant. Hence, always choose to go for a V neck when you but your clothes. If you can manage a deep neck that would be brilliant but even a simple V necked blouse would look gorgeous on your figure. Same goes for v necked open front jackets and shirts that keep your neckline open and pull the focus towards your face. 4. Wear A Line Skirts – Skirts are feminine and comfortable but most plus size women run away from them because they think it makes them look bulky and unattractive. Perish the thought for A-line skirts are just the thing you are looking for. The A line style creates a nice flattering effect by keeping it feminine but slimmer at the same time. Plus size women have a lot of styles from choose from, if they know the right brands and stores that cater for them. Don’t let anything get you down, just keep these tips in mind and rock the world fashionably.